"Rank doesn't mean anything of itself. What counts is what you know", somebody once said to me. Rank in the martial arts is generally equated with knowledge. What about applying what you know? With that said, is it advisable to acquire knowledge of a multitude of techniques or is it better and more practical to have just a few at your disposal? In boxing, there are four basic techniques: jab, cross, hook and uppercut. Yet an endless array of combinations and tactics are at hand for the boxer's discretion. "Shadow boxing" is the pugilist's version of kata (practice forms). Most karate systems offer over a dozen of these forms to be learned through black belt and beyond. Choki Motobu, Okinawan karate's early embodiment of a tough guy, preferred training on only one kata - one that he felt utilized the necessary side-to-side movement for an actual street fight. Since Motobu's version of bunkai (application) made use of an unwitting but usually very willing uke it's hard to argue with his methods. Learning a plethora of skills is one thing; knowing which ones to use in a moment's notice is quite another. Practitioners who fear arriving at a plateau in their art probably aren't being creative enough with what they already have or don't have somebody capable if showing them how. Variations are key, and it's quite often just a matter of focus. For example, the bunkai for an outside middle block as shown to a novice is strictly defensive - it's just a block. For a more advanced trainee, the very same block turns into a backfist driven into the biceps of the attacker causing muscular trauma. Defense becomes offense (kobo-ichi) all from the same move. Understanding the depth and variety from a select few techniques is far better than a cursory view of too many. "With that said, is it advisable to acquire knowledge of a multitude of techniques or is it better and more practical to have just a few at your disposal?" Learn one technique or one hundred, if you don't have the requisite experience, aren't trained right, and don't have the skill - you can't make it work. I found this out when I was a young BB traveling to another school, and got creamed over and over again until I got it. The boxing example has been used to show that kata training is outmoded. Kata is only outmoded when it is not used as a way to generate and transmit skill. Who have you seen fight like they perform kata? Who have you seen perform kata like they fight? Don't blame the tool, eh? "Learning a plethora of skills is one thing; knowing which ones to use in a moment's notice is quite another." Kata doesn't teach you skill. It teaches you technique. Skill is gained from using those techniques (and their variants) to accomplish a certain objective. First, I want to add my appreciation for this blog. I began reading because the connection to Isshinryu (my training art), and I continue to read because of the quality of discussion -- both the posts and the comments are respectful and usually insightful. This is sometimes a rare thing in the martial arts, and in Isshinryu in particular! Colin rhetorically asked Who have you seen fight like they perform kata? Who have you seen perform kata like they fight? My sensei repeatedly urges us to train with energy and enthusiasm, visualizing what we are doing with each kata. "You will fight the same way that you train. If your kata is lethargic and lacking power, don't expect a big change when you find yourself in a fighting situation!" I have seen my sensei, and his sensei, fight with kata and do kata as they fight. It is quite inspiring. Every class we do kata. Every kata has multiple techniques for fighting. Develop the skills, add experience, add more skills, and keep learning. The valuable techniques are the ones you can make work -- whether it is one or many. However, I would think that being able to make many techniques work well increases the chances that one single technique will get the job done. Rank as to the belt worn regardless of color does not mean anything and it is what you do on the floor. Totally on the mark! As to learning a plethora of skills I have always been of the mind that until you have perfected the basics, charts I & II and basic kata bunkai, and made them work on the floor it is useless to learn a ton of things. I firmly believe that it is the quality of what you learn and not the quantity. In today's MA it seems that quantity is what matters. This is why I have focused on just Isshinryu all these years. I just don't feel that leaning five or six styles creates a better MA. I agree that what we should be doing is focusing on one style and maybe one to three kata and perfect it in form, technique, focus, and so on then perfect it and its many variations in combat. Yet, who would listen in today's (mostly) MA Arena. That's how I feel about learning bellydance--which is a very demanding dance form, second only to ballet according to the "experts." I'd rather master one move at a time and work from there instead of trying to display a whole lot of mediocre variety. It is said that most styles merge in the end. The importance of basics in training as already been established and is constantly reminded to us by various means. Good basics = good art = foundation to learn other stuff = using the basic for various purposes. -what you want out of a martial art. -what a teacher CAN give you. Cheers on another fine post. Who have you seen fight like they perform kata? Truthfully I haven't. Kata (and other training tools) pales in comparison to experience, which is the ultimate training tool. Welcome to my site. Yes, how you train is how it happens. I try to infuse as much passion into my kata as I can muster for that reason. But from a technical standpoint I question the effectiveness of pre-arranged kata training for the changing reality of a chaotic fight. There is no pattern to a brawl. One technique is all that is required to get the job done, irrespective of how many you know. Donn Draeger used the term "technical shipwreck" to describe the brainfreeze a trainee experiences from being bogged down with too much material to work from. The real trick here is to find what actually does work, then to abandon what doesn't. Thank you for sharing your thoughts. The value I see in checking out other styles is that it tends to illuminate the one we're involved in already. This is the reason theologians study religions other than their own. But no matter how much you study, ultimately we become our own stylist. Yes, the teacher's ability to teach and the student's willingness to learn determines everything, not the so-called style. I'm also a big believer in basics, i.e. mastering them. Obviously there's a huge difference (or at least there should be) between the way a white belt and a black belt perform the very same basic. "My sensei repeatedly urges us to train with energy and enthusiasm, visualizing what we are doing with each kata. " Yoda: that's a wonderful training tip. For the longest time I'd plod through kata. Not that I wouldn't put any energy into it ... I'd just do it for the sake of it. Only when I approached it like I needed it, then it all started to make sense to me. "Kata (and other training tools) pales in comparison to experience, which is the ultimate training tool." John: Well, if all you had was kata and you didn't really want to face life-threatening danger, *and* a colleague (who learns the same kata) just came running in to tell you that 'hey, the techniques helped me to defend against this sword bearing maniac,' I'd reckon you'd stop and listen. Experience is very important - but I'd give other people's experience as much priority - and feed it through the kata framework if I can. I believe the pictures of that of Kenichi Sawai. He learned YiQuan in China, and brought it back to Japan, where he referred to it as Taikiken. Mas Oyama, the founder of Kyukushin Karate was a close friend of his, and many schools of Kyukushin still practice some Taikiken methods. I would find my abilities to put into action what I'd learned when my instructor would push me out of my comfort zone. I'm leery of that word "if". I realize the value of kata training. And I did mention in my post that Motobu utilized elements of a certain kata to develop some of his fighting prowess. I'm sure you'll agree that it's the bunkai that's relevant for actual combat. Speaking of bunkai, I'd love to see that application for the maniac with the sword! I knew it was some guy named Sawai. Interesting that Oyama integrated some Taikiken into his Kyokushin. Thanks for the info. The comfort zone isn't all bad as long as we don't reside there too long. As for abilities, you'll be gaining some with your new tai chi regimen. A belt is something that holds up your pants! "I'm leery of that word "if". " That is reasonable esp if someone touted invincible tools against worst case scenarios w/out being there himself. However, to me, Kata is the same as a hypothesis to be tested. You test it by using the techniques (or as you say the applications for techniques) and discussing results. Without this approach, how would anyone discover "the depth and variety from a select few techniques" -- or any technique for that matter? 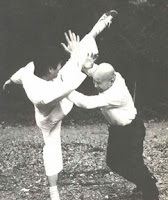 About Sawai and Taikiken/Yiquan, and the topic, "Less is more." YiQuan is one of those tricky endeavours without techniques or forms. My understanding is that at its apex, the martial arts are absorbed into the natural movements of the practitioner as formless. This concept is especially emphasized in the internal systems. As I've mentioned somewhere before, my Sifu taught us that the form (the kwen) is the heart and soul of kung fu. The fact that the moves in the kwen may teach me self-defence is a bonus for me, but it's not the reason why I train. In the forms, your opponent is yourself. I find the distinction between performing kata and fighting interesting. I remember the first time I saw sparring - I was shocked at how little it resembled the choreagraphed moves of the forms. But without those moves, without that choreography, what are you left with? Just fighting. Not a martial art. So forms in Chinese styles are called kwen - I didn't know that. It's true that sparring and forms bear little resemblance to each other. I noticed that too when I first started. Sparring is spontaneous; kata is rehearsed. They both have positive features and shortcomings though. Chinese forms are beautiful to watch. A guy I used to train with came from a preying mantis background and used to practice his forms in our dojo. Equal parts of grace and power in those moves. I'm familiar with some schools that utilize sparring to the exclusion of all else. They're more like kickboxing clubs. That's fine, but there should be something aesthetic to it also; after all, they're called martial arts. However there are some authentic styles that teach no forms at all. Thanks for your input, KFG.